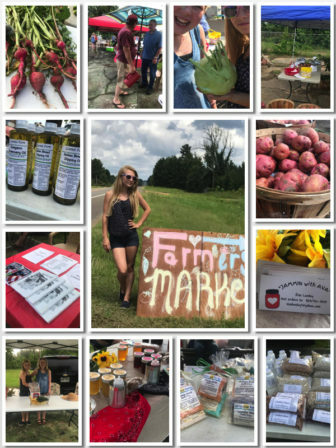 June 3, 2017, Fouke, AR– The news is spreading fast about our small town market! Today was our unofficial first day to be able to come together with the exception of some of the vendors being out due to unforeseen circumstances but next week we intend to be in full swing! This week the theme was “kids day”. We did “pinch pot planters” for any child that visited the market. Next week the theme is “reuse reduce and recycle” so we will be planting in old toys rubber boots and what ever else we come across! All market activity are always free so children can come out and have a little fun! We hope everyone can come out and get a chance to experience some of our small town charm at this years market! Whether your looking for produce from Mr. Story, jams and jellies from Ms. Lemley, all the goodies Mr. Loomis brings from his farm or just want to get a one of a kind cook book from The Citizens for a Better Community, with us growing every weekend we know that we will have the one thing you won’t be able to leave without! Come out and visit us at 811 N. Monster expressway Fouke Arkansas 8am-2pm weather permitting threw August! The opinions, pictures, and information presented here are those of the submitting person and do not belong or represent the Four States News. TEXARKANA, TX- The Texarkana, Texas Farmers’ Market spring season will begin on Saturday, April 21 featuring a Meet Your Farmer Day sponsored by Farmers’ Bank & Trust. The Market will open at 7:00 a.m. and stay open until 12:00 p.m. The spring market schedule spans a total of 15 weeks and will conclude on Saturday, July 28. Texarkana, AR - Enter Bobby Ferguson Park near UofA Way or pass it as you come off the Interstate and you'll see a nice, rock sign on the hillside just inside the park informing you of the park's name. However, if you enter from the Fairgrounds end of the park, there is no sign to indicate the name of the park. Soon, the lack of a park sign will not be a problem near the Four States Fairgrounds. The Texarkana Arkansas Beautiful Commission works to improve the appearance and beautification of Texarkana, Arkansas. In addition to having clean-up days, dumpster trash days, planting days, and coordinating education about keeping the city clean, the commission has overseen the implementation of signs for city properties. The most recent sign, the huge "Welcome to Texarkana" sign on the Interstate was one of the larger sign projects the commission has undertaken in recent years. It’s fishing time again! I know there are people thinking, “It’s always fishing time,” but for me fishing time starts after winter and ends about the time my teeth stop chattering from the cold. In simple terms, I fish in the Spring until the end of fall. I’m what you call a leisure fishing guy. I’m not so serious about fishing that I have a five hundred dollar rod and reel, but I also enjoy the use of good equipment. I enjoy fishing equipment so much, that once I have the basic stuff together, I rarely buy new. This year as the fishing season kicked off for me my favorite reel from 1989 (A Zebco Rhino) broke. After thirty years, the reel finally gave up. I trudged off to the store to get a new one and while I was there I decided it was time to invest in a new tackle box as well. This was not an easy decision for me. As old as that reel was, my Plano 6300N is actually older. The box dates back nearly forty years ago. I decided it was time for a new tackle box to go hand-in-hand with the new rod and reel. As a blessed man that I am, my wife stood nearby encouraging me to get the best tackle box I wanted and planned to use for the next several years. The Miller County Master Gardeners will hold a plant sale this Saturday from 8 a.m. to 1 p.m. The sale will be held at the Home Arts Building at the Four States Fairgrounds and is open to the public. Funds from the sale will be used to complete projects in Miller County. The Miller County Master Gardeners work with local elementary schools, summer programs at the library, and they assist in maintaining the various flower beds at the Miller County Courthouse. The group also assist with various other community projects throughout the year. Those interested in purchasing plants or talking with the Miler County Master Gardeners group should attend April 6 – this Saturday – at the Four States Fairgrounds’ Home Arts Building. Gardeners will be onsite from 8 a.m. to 1 p.m. to answer questions and offer plants for sale. As of 1:30 today, the group is already onsite setting up the large selection of plants for the sale. TEXARKANA, TX- The City of Texarkana, Texas Parks and Recreation Department will host Movies in the Park at Spring Lake Park beginning May 24th. The movie schedule for Summer 2018 includes: Coco on May 24 Jumanji: Welcome to the Jungle on May 31 Wonder on June 7 Paddington 2 on June The movie will start around 7:45 p.m. and concessions will be available. Fouke, AR – Have you ever wanted to do something, but then just found you did not have the funds to make it happen? Maybe you wanted to go on a fancy vacation, or a trip to the lake, or even a trip to McDonald’s, but when you pulled that pocket book out, the bank said, “Not today”. If you have found that to be case, or even if you have the funds, but you’re just not about to spend them, the “We Love Fouke” Facebook page has an answer for you. It’s time for a good old fashioned scavenger hunt. The concept is easy and can be applied for a “family fun activity,” or for a “cheap date” – ladies, do not hold the Four States News responsible if you get a cheap date – all this easy scavenger hunt needs is a little gas in the care and a digital camera. You can use your camera, phone, or whatever takes pictu res. Using the list provided on the Facebook page (as seen here too) you simply download the list and look for things indicated. Once you find them, take a picture or just make a note of the information being sought. Points are awarded for each find.